Last April, the Center for American Progress released the report of CAP’s Task Force on Poverty, From Poverty to Prosperity, calling for a national goal of cutting poverty in half in 10 years. 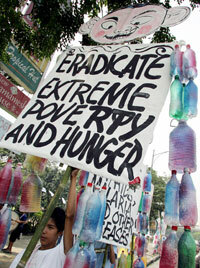 This week, the House of Representatives endorsed this goal, when on January, 22, 2008, the House passed House Concurrent Resolution 198 via voice vote without objection, declaring the sense of the Congress that the United States should set a national goal of cutting poverty in half over the next 10 years. The resolution was introduced by Congresswoman Barbara Lee (D-CA), cosponsored by over 80 other representatives, and its passage was supported by many others, including Rep. Chris Shays (R-CT). The resolution is non-binding, meaning that it does not have an immediate, direct effect. However, it establishes the need to actively pursue policymaking to reduce poverty, and it will be something that members and advocates can point to in the drafting of future legislation. One in eight Americans, approximately 36.5 million, have incomes below the official federal poverty line, according to 2006 numbers. This is 4.9 million more people than in 2000. The poverty rate for children is the highest of all age groups. And people of color are far more likely to live in poverty. In 2006, 24.3 percent of African Americans, 20.6 percent of Hispanics, and 10.3 percent of Asian Americans lived in poverty in the United States as compared to only 8.2 percent of whites. While the passage of House Concurrent Resolution 198 is a positive development in reducing poverty in the United States, the next step is for Congress to take action to make the goal of cutting poverty a reality in the next decade. An anti-poverty movement is brewing across the country. Groups such as Catholic Charities, Sojourners, and others have called for a national goal of cutting poverty in half. Governors, mayors, and legislatures in a number of cities and states have initiated anti-poverty campaigns, resolutions, and legislation. Connecticut, Vermont, and Delaware have legislative or governor-established task forces charged with developing strategies to cut child poverty in half, and Minnesota has a state legislative commission charged with developing a strategy to end poverty in the state by 2020. The Association of Community Organizations for Reform Now, the Center for American Progress, the Coalition on Human Needs, the Leadership Conference on Civil Rights, and the LCCR Education Fund will soon be launching a multiyear, multifaceted public awareness and advocacy campaign to cut poverty in the United States in half in the next 10 years.